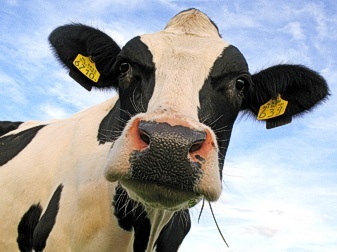 In 1999, the European Community (EU) banned importation of US-produced milk. The EU upper limit on somatic cell count was 400,000 and 100,000 on bacteria count. The limit set by USDA in the US was 750,000 and 200,000 bacteria count. This was considered too high and import from the US was prohibited. Tests with GO2TM on a small dairy farm in Canada began using GO 2 with 150 dairy cows. Within 14 days the somatic cell count in the produced milk dropped from 250,000 to 147,000. The dairy achieved a higher price for its milk. In a second dairy operation with 970 cows the volume of water consumed by the dairy cows increased within six weeks from 97,000 liters/day to 102,000 liters/day. The milk per cow increased by between 2 and 3 liters per day, without the use of bovine growth hormones (BST). This clearly shows that clean water has a great impact on the quality of milk, and the amount of milk a dairy can produce. It directly relates to more output of a better quality, which leads to higher financial figures. The Pasteurized Milk Ordinance (PMO) is a document that specifies safety standards of Grade A milk (for human consumption). Public health standards for somatic cells in raw milk are designed to protect public health, not to maximize dairy product quality and shelf life. There is continuing pressure from a variety of groups to reduce the regulatory limit for somatic cells in milk from the current 750,000 cells/ml to 400,000 cells/ml or less to increase the safety of dairy products, and to meet the standards for importation to Europe. Historically, two grades of milk have been identified: Grade A and Grade B. The grade depends on the milk meeting certain health (sanitary) standards. Sanitary standards, some of which might also be called "quality standards," include the somatic cell count and bacterial count and the conditions of farm facilities, including the milking parlor, milk storage tank, and water well. Grade A milk meets the sanitary standards for use in fluid milk products and can be used for any dairy product. Grade B, or manufacturing grade milk, meets slightly lower standards and can be used only for manufactured dairy products. How does Grade A Milk Differ from Grade B Milk? The designation, "Grade A" denotes higher quality milk that has been produced under more sanitary conditions. Grade A dairy farms are inspected regularly to ensure that Grade A conditions are maintained in the production of milk, e.g., cleanliness of the facility and of the cows, suitability of the milking parlor and sanitary handling (and cooling) of the milk. Furthermore, specific bacteriological limits are placed on Grade A milk, including Standard Plate Counts for bacteria, maximum somatic cell counts and maximum limits on Coliform and Laboratory Pasteurized Counts. A measure of milk quality. There are some organisms capable of surviving milk pasteurization or refrigeration processes. Keeping the level of these organisms low is a quality standard. Milk produced under sanitary conditions that qualify it for fluid consumption. Only Grade A milk is regulated under Federal milk marketing orders. Milk not meeting the fluid grade standards. Less stringent standards generally apply. A measure of milk quality based on the number of somatic cells that appear in the milk. Somatic means "of or related to the body" so that almost any body cell is included. The number of the white blood cells (infection-fighting cells) is relevant here. High levels of these cells appear in response to inflammations that can be a sign of mastitis. The composition of milk can be influenced by somatic cell counts. Whenever the bacterial estimate indicates the presence of more than 500,000 bacteria per ml the following procedures are applied: The producer shall be notified with a warning of the excessive bacterial estimate. Whenever two of the last four consecutive bacterial estimates exceed 500,000 per ml the appropriate regulatory authority shall be notified and a written warning notice given to the producer. The notice shall be in effect as long as two of the last four consecutive samples exceed 500,000 per ml. Additional samples are taken after a lapse of 3 days but within 21 days of the notice . If this sample also exceeds 500,000 per ml subsequent milkings shall be excluded from the market until satisfactory compliance is obtained. Shipment may be resumed and a temporary status assigned to the producer by the appropriate State regulatory agency when an additional sample of herd or flock milk is tested and found satisfactory. The producer shall be assigned a full reinstatement status when three out of four consecutive bacterial estimates do not exceed 500,000 per ml. The samples shall be taken at a rate of not more than two per week on separate days within a 3-week period. Three of the last five milk samples have exceeded the maximum bacterial estimate of 500,000 per ml. Three of the last five milk samples have exceeded the maximum somatic cell count level of 750,000 per ml.